If you were inspired by the healing practices and plants used in the film, you can bring these traditions into your home with The Sacred Cookbook. These ancient and delicious healing recipes come from years of travel and exploration into ancient and mysterious cultures. You won’t find these medicinal morsels anywhere else! Available in both physical and digital format, this course is unlike any other healing tool you have ever seen. 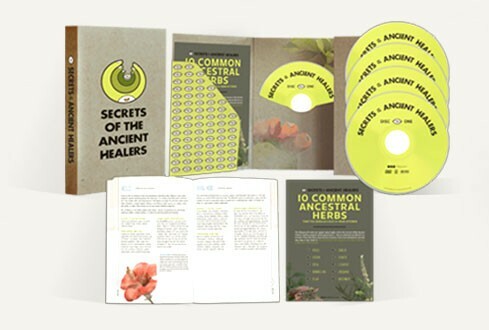 With over 6 hours of beautifully filmed, information-packed video and a dynamic and easy-to-navigate course guide, Secrets of the Ancient Healers gives you unprecedented access to some of the most ancient and effective healing remedies ever discovered. The Secrets of the Ancient Healers program not only illuminates a whole new world of natural medicine, it also shows you how to turn your home into a personal retreat center for health and happiness. You hold within you all the wisdom of your ancestors. We’ll help you access it. Get started NOW with Energy Healing Knowledge from more than two dozen healing modes and traditions from around the world. Practical exercises, guided meditations and fireside chats you can experience from anywhere. Parkinson’s Disease, Breast Cancer, Diabetes, Depression… Despite remarkable advances in modern medicine, our society still struggles to effectively treat these and other common illnesses. Witness the story of eight brave souls as they leave the developed world behind in search of deeper answers. Living in seclusion for one month in the heart of the Amazon jungle, these men and women take part in the powerful healing practices of Peru’s indigenous medicine men, working with centuries-old plant remedies and spiritual disciplines. In their most desperate hour, these patients are forced to confront not only their physical ailments, but their own spiritual and psychological barriers in the process. Five will return with real results, two will return disappointed, and one won’t come back at all.